The Yeshiva is hosting a Mega Event in Israel celebrating its 50th anniversary (Yovel). It will take place on Thursday of Chol Hamoed Sukkot, 18 Tishrei, September 27, 2018. There is a full list of activities for all ages. Register now at http://tickchak.co.il/2283/en or fill out the quick sign-up at tinyurl.com/yovel50. 1. Why did the Yeshiva decide to host a Yovel event? The Yeshiva is always interested in strengthening its connection with its alumni. Therefore the Yeshiva administration decided to celebrate all together on the Yeshiva campus in an effort to help its alumni once again “experience” the Yeshiva. The date was chosen to allow the maximum number of alumni and their families to participate and reconnect, to all the alumnus to introduce his family to the Yeshiva and his experience here through tours, activities, and more. 2. Who is invited to this event? The Yovel event is meant for all alumni of the Yeshiva, their wives, and their children. 3. When and where is the event taking place? The event will take place at the Yeshivat Har Etzion campus on Thursday of Chol Hamoed Sukkot, 18 Tishrei, September 27, 2018. Between 12 noon and 5 PM there are 3 time slots of different activities to choose. At 5 PM there is Mincha in the Beit Midrash. At 5:15 PM there is a meet-and-greet for all overseas alumni in the Sukka on the patio near the Chadar Ochel and office. After there is a light dinner followed by the Yovel Gala Celebration closing ceremony. 4. Can one participate in just part of the event? 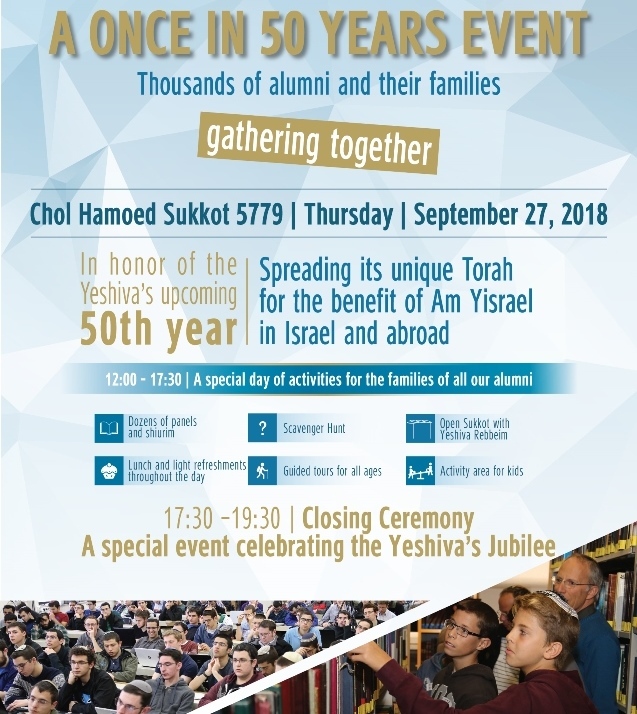 We recommend taking advantage of Chol Hamoed Sukkot to be part of this “once in 50 years” event for alumni and their families. However, one can indeed take part in just a portion of the event. 5. How does one sign up? At http://tickchak.co.il/2283/en or fill out the quick sign-up at tinyurl.com/yovel50. That being said, there is an incredible amount of resources being invested in the Yeshiva’s programming in general and in making this event in particular, and we are happy for our alumni to help out with our goals. Yes. There is a family activity scavenger hunt (“escape room”) that was created just for this event. It is meant to have activities for all ages in the family, helping everyone see many different parts of the campus. Don’t miss it! 8. What activities are there for my young children? The schedule includes opportunities for parent-child learning as well as a children’s activity area. The children’s activity area exists throughout the morning with no need to sign up for a particular time-slot. It includes pita baking, photo magnets, making a mosaic, bouncy castles, “fishing” (plastic fish with a message inside), and more. There is also a play meant for children. 9. What is there for my older kids (12-17) to do? The schedule includes some guided tours including a water hike and a bicycle tour. Spots are limited. Sign up now. The teens are also welcome to join the many different shiurim and to learn with their parents in the guided learning in the Beit Midrash. 10. Will there be food at this event? Yes. The Yeshiva is putting up multiple large Sukkot that you can use throughout the day. Each person in attendance will receive a sandwich and salads for lunch. In addition, there will be coffee and snacks set up throughout the day. There will also be stands selling popcorn, slush, ices, and more for a nominal fee. 11. What is happening at the closing ceremony? The Gala Yovel Celebration will tell the story of the Yeshiva and will include some videos (for the whole family) and presentation of awards. One of the videos will be the musical “kululam” video created for this event. 12. I signed up but want to change my choices. Contact the office. Please don’t re-register. 13. What do we have to bring to the event? The Yeshiva is investing a lot to make sure you can attend with minimal hassle. Before the event those who signed up will receive an email with full instructions and a personal schedule for each family member. It is recommended to dress weather appropriate (the closing ceremony will end after dark and it may be colder out). Of course one can bring extra snacks to eat throughout the day. 14. What is the “Sukkat Roshei Yeshiva?” I don’t see it on the schedule. There are some activities at the Yovel event that are not on the schedule. For example, the Roshei Yeshiva will be sitting in an open Sukka to greet as many alumni and their families as possible, and possibly to share some short Divrei Torah when appropriate. on Thursday, Sept. 27, Chol Hamoed Sukkot! and Hebrew and English programming throughout the day. about this from them, please email them as well).